Does Libya deserve 40 more years of the Gaddafi’s tyranny? In his book “Seeking Gaddafi”, the British MP Daniel Kawczynski focused on the sinister aspects of the Gaddafi’s dictatorial misrule. Ghaddafi is now fighting his own people to cling to power. Libya is burning and the world is dithering and cannot decide whether to impose a no-fly zone or not. The Obama Administration has miserably failed to provide a decisive leadership in dealing with Gaddafi. The EU is confused and NATO has been rendered impotent by the squabbling politicians. You cannot help feeling that inaction by the world is a tacit admission of failure at best and collusion with the tyrant at worst. When I met Daniel recently at a House of Commons function, we discussed this subject and I observed that if Gaddafi is allowed to win, we are in effect telling the Libyan people “you are to have 40 more years of the Gaddafi’s tyranny”. Daniel Kawczynski agreed. The book came out a few months before the popular revolution in Tunisia, Egypt and Libya, but the contents are more relevant now than ever. 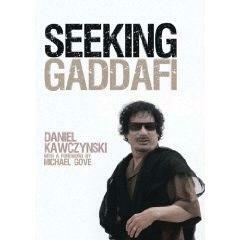 I will not make much of the fact that the Daniel Kawczynski had not met Gaddafi in person, as some reviewers have done. Even if a meeting took place, I doubt we would have learnt more about Gaddafi than what is already in the book. The book gives a fascinating insight into the complex personality of Gaddafi who came across as a cunning ruthless dictator who thrives on chaos and absurdity. Look at the absurd long name he chose for Libya: Al-Jamahiriya Al-Arabiyya Al-Libiyya Al-Sha’abyya Al-Ishtirakiyya Al-Uzma (The Great Socialist People’s Libya Arab Jamahiriya Republic). Despite the tediously long and laughable name, Libya has no civil society and no institutions but it has revolutionary committees, informers and a bloated “soggy” public sector which is barely functioning. Hospitals, schools and universities and public utilities suffer from incompetent management and very low standards. No one dares to complain. Despite the discovery of oil in 1959 Libya has failed to achieve the levels of prosperity achieved in the Arabian Gulf States. Gaddafi has not done well for his people. The same cannot be said about his cronies of sycophants and henchmen who got too fat at the expense of the people. Two aspects of Gaddafi’s behaviour called into question his suitability for ruling Libya. First his support for terrorist organizations such as the IRA and Black September and secondly his support for odious dictators Such as Idi Amin former dictator of Uganda, Robert Mugabe of Zimbabwe, Omar Al-Basheer of Sudan and we learn from the book that he was a keen fan of Nicolae Ceausescu the Romanian dictator who was executed in 1989. Gaddafi is always seeking respectability in the Arab World. This has eluded him so he turned to Africa. He wanted to be the King of Kings. Most Arabs still think of Gaddafi as an unstable character whose disastrous policies have ruined a potentially wealthy country. The book highlighted with sufficient details the disasters that befell Libya due to the grave mistakes of its unwise and erratic leadership. For example in August 1978 the respected Lebanese Shia leader Imam Musa al-Sadr disappeared during a visit to the country. The murder of Yvonne Fletcher on 17April 1984 outside the Libyan embassy in St. James Square, London remains to be resolved. A Libyan embassy official fired the fatal shot. Then in 1988 Pan Am Flight 103 exploded over Lockerbie in Scotland killing 270 people. In 2003 Libya agreed to pay up to 10 million US Dollars per victim (2.7bn US dollars in total) in compensation. In the 1980s Libyan dissidents in Europe were targeted and murdered under the “Stray Dogs” campaign. Abdullah Senussi (head of military intelligence) a brother-in-law of Gaddafi orchestrated and directly supervised the shooting in cold blood of 1200 prisoners in Abu Salem Prison on 28 June 1996. The reason for the massacre was that the prisoners dared to protest against the appalling conditions. In 2004 Tony Blair the UK Prime Minister held historic talks with Gaddafi. They became close friends. However the most significant development occurred after the fall of Saddam in 2003 and his subsequent capture in a miserable hole. These events concentrated the mind of Muammar Gaddafi. Libya renounced its WMD program. Most Arab observers believe that Gaddafi was afraid that he would face a similar fate if he persisted with his WMD program. I strongly recommend “Seeking Gaddafi” which has a wealth of information about Libya and can be used as an authoritative reference. This article must have been written a few days before the EU/USA/Arab League decided to strike the Libyan Regime. The sooner this tyrannical regime is removed the better for everyone. Of course not, no one deserves 40 years of brutal rule. The good news is Gaddafi is finished and is destined to Hell.